The first recorded application of density measurement was for fraud detection. The density measurement concept then expanded to encompass determination of material composition and assessment of product quality. Starting with crude measurements of liquid displacement, techniques expanded to the development of the hydrometer. The hydrometer has been use for more than 1,400 years. The arrival of advanced digital electronics in the mid 20th century led to instrumentation based on indirect measurements. The concept of density was conceived in about 250 BC. It took another 900 years for the next development in density testing techniques to happen. That was the development of the hydrometer. Another 1,400+ years passed before the next significant innovation. In 1967, the oscillating U-tube began a trend to digital test results. Over the centuries the use of density to determine the properties of materials has grown. In the case of liquids, concentration of sugar, classification of petroleum products, proof or alcohol percentage, sulfuric acid concentration, and specific gravity are examples of density measurement applications. These tests have become critical quality measurements in industries such as beverages, petroleum, pharmaceutical and chemical production. The King of Syracuse suspected he was being defrauded by his Crown Maker. Archime des was commissioned to prove it. 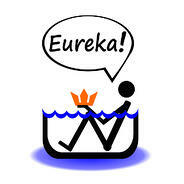 Archimedes' method was to compare the weight of the King’s gold crown to the weight of the suspected fraudulent crown. He developed a method of comparing the weight of two items that have the same volume. This concept, conceived around 250BC is known as density. Weighing a known volume of a substance or determining the liquid displacement of the sample are the basic tenants of Archimedes' concepts. The early techniques involved collecting a sample of known volume and weighing it, or checking its displacement in a liquid. Somewhat tedious procedures. At the turn of the 5th century, another Greek, the scholar Hypatia of Alexandria, invented the Hydrometer. The hydrometer is a sealed hollow glass tube with a narrow stem and a wider bottom portion. A ballast or weight of known amount is secured to the bottom. When placed in a liquid, the hydrometer will float upright. There is a scale in the narrow stem which provides a reference on how deeply the instrument sinks into the liquid. The lower the density of the sample, the deeper the hydrometer sinks. The hydrometer represented a significant improvement in the efficiency of liquid density testing. However, it is prone to reading and transcription errors. In 1967, the first digital density meter was introduced. It is based on the principle that the frequency of oscillation of a hollow tube changes when filled with a liquid. The frequency changes correlate to the density of the liquid. With this technique, it is possible to represent density in digital form. Calculation of different scales, needed in various industries, is automatic. The basic procedure for this method is to vibrate an empty hollow tube at a known frequency. After filling the tube with liquid, the vibration frequency will change. This change is translated into the density the of the liquid. Once the density is established, conversion to industry/application scales is easily made by simple, automatic programs. The oscillating U-tube, with its digital capabilities, has made portable density instruments possible. Not only can samples be tested in the field and results converted to whatever scale is needed, but the test reading can be automatically stored for later retrieval and analysis. The design of these instruments removes the interpretation and recording errors inherent with hydrometers. The test process is simple. That, combined with the ability to test anywhere, brings strong benefits to users with many sample locations. The automatic recording cuts training time and lowers skill level requirements. 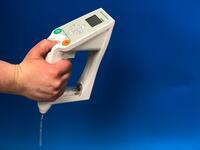 Another major breakthrough in density measurement capabilities. From its start as fraud detection, the concept of density testing has expanded to a wide scope of material assessment and quality control applications. The early testing methods required extensive setup and boring test procedures. The introduction of the hydrometer and the development of product specific industry/application scales broadened the range of applications and simplified testing. A massive reduction in complexity and skill requirements for testing was facilitated by the introduction of the oscillating U-tube. Increased capabilities of data retention and analysis resulted. These developments lead to the availability of portable density instruments. The time period in between the introduction of the density concept and introduction of automatic instruments is noteworthy. Nearly six centuries from Archimedes' first revelation until the Hydrometer. Another ten centuries were needed until the oscillating U-tube technique arrived. I’m always awed by the time it takes to make serious breakthroughs in testing concepts and techniques. Please share this with colleagues who need to test for density. Until I take on the next paradox. P.S. You can subscribe to our articles and newsletters by placing your email address in the space to the right of the title.